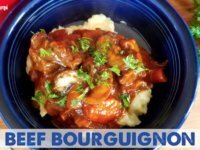 Boeuf Bourguignon, or Beef Burgundy, is slow-simmered beef with bacon, carrots, onions, and a red wine sauce. Make Julia Child proud and make some tonight! Dice the bacon and cook it in a large pan on the stove. Remove the bacon to a plate, leaving the drippings in the pan. Add half of the butter to the bacon drippings and melt. Cut the beef into 1 to 2 inch cubes and roll in the almond or coconut flour. Brown the meat in batches in the bacon drippings and butter. Put the browned beef and bacon into a large baking or casserole dish with a cover. Chop the carrots and onion and brown slightly in the same pan. Put the vegetables in the baking/casserole dish with beef. After the vegetables are removed from the pan, pour the wine into the pan, scraping the bottom to remove all the browned bits. Bring the wine to a boil, then reduce the heat and simmer for 5-10 minutes to allow the alcohol to evaporate. While the wine is simmering, add the tomato paste, garlic, salt, pepper, basil, parsley, and thyme to the dish with the meat and vegetables and stir to combine. Pour the wine and broth over the mixture and cover. Cook in the preheated oven 2½-3 hours until beef is fork tender and breaks apart easily. About 15 minutes before the beef is done, slice the mushrooms and brown in a skillet with the remaining 2 tablespoons of butter. Add to the beef and cook an additional 5-10 minutes in the oven, uncovered. Remove from oven and, let rest 10 minutes before serving. See below for Crock Pot and Instant Pot instructions. The red wine is what gives this dish its name, but feel free to use beef broth if you'd rather not use wine. Crock Pot Method: To cook in the Crock Pot brown the bacon and beef as in the stovetop/oven method. Deglaze the pan with wine before adding all the ingredients (except the mushrooms) to the Crock Pot. Cook on low for 6-8 hours. Add the mushrooms for the last 10 minutes of cook time. Instant Pot Method: Use the Sauté function to brown the bacon and beef in batches. Deglaze with the red wine and simmer uncovered for 10 minutes. Add all the remaining ingredients except the mushrooms and cook at high pressure for 35 minutes. Allow a 10 minute natural pressure realease, add the mushrooms, and return to a simmer for 10 minutes.